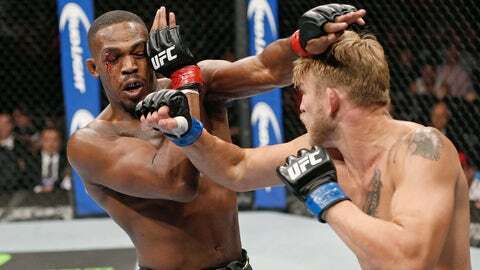 Alexander Gustafsson faces off with Jon Jones again...but not in the Octagon. When Jon Jones picks up the first EA Sports UFC video game in the spring he’s going to see someone very familiar posing next to him on the cover. Back in September at UFC 165, Jones and Alexander Gustafsson damn near took each other’s heads off in one of the best fights of 2013. Now, the two rivals will be locked in history forever, alongside one another on the box of a milestone video game for the UFC. Gustafsson won the EA Sports cover vote tournament, beating Georges St-Pierre in the finals last week, it was announced Friday. The fans have spoken and the big Swede has become one of the most popular fighters in the UFC. The game should be coming out around the same time Jones meets Glover Teixeira at UFC 172 in April. And Gustafsson is the main reason why Jones won’t be able to fight until then. The UFC light heavyweight champion is still banged up from that knock-down, drag-out fight three months ago. Before that night, there would have been very little chance Gustafsson would have gotten to the final round of the cover vote, let alone beaten someone like St-Pierre. There are conspiracy theorists saying that GSP would have won if he hadn’t decided to step away from the UFC, an announcement made Friday. And maybe there’s some truth to that. But there’s little doubt that Gustafsson’s popularity has grown exponentially in a short amount of time. He’s arguably the most popular UFC fighter in Europe at this point. Jones and Gustafsson will likely meet again, perhaps before the end of 2014 – as long as there’s no Madden-like curse. But until that happens, you’ll have to settle for pitting them against each other in the game. You know that’s the first thing the uber-competitive Jones will be doing when he rips open the packaging. It’ll be UFC 165 all over again - in pixel form.